The final score was misleading, you could say. Top-ranked Nebraska’s seventh consecutive victory in 1983 came at Missouri. The final score was 34-13. If the Husker defense hadn’t stepped up, however . 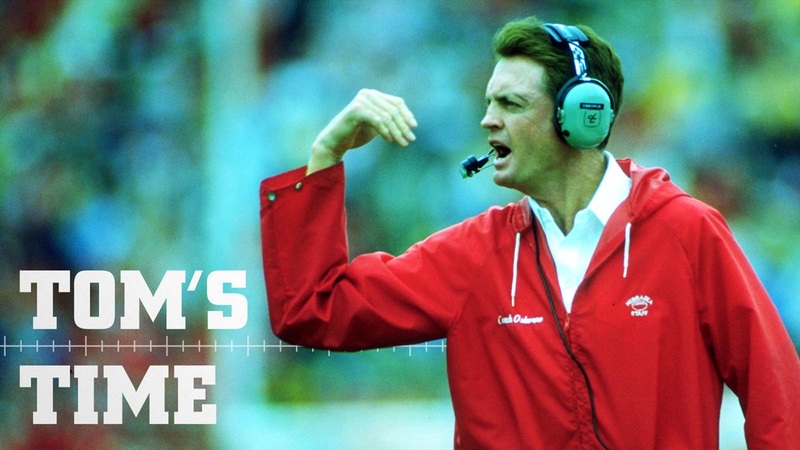 . .
”The defense played very well in the second half,” Tom Osborne said. Nebraska led 20-13 at halftime, on touchdowns by Irving Fryar, Mark Schellen and Mike Rozier, who broke loose for 60 yards with 4:51 remaining before the intermission. Fryar and quarterback Turner Gill teamed up on a 38-yard touchdown pass in the first quarter after Missouri quarterback Marlon Adler opened the scoring with a 6-yard run. Schellen’s touchdown, on a 20-yard run, gave the Huskers a lead they wouldn’t relinquish, but Missouri had opportunities to tie or take the lead in the third quarter. The first came on the opening possession of the second half. The Tigers drove to the Nebraska 10-yard line, where they faced fourth-and-1. Coach Warren Powers opted to go for the first down rather than settling for a third Brad Burditt field goal. Husker defensive end Bill Weber stopped Eric Drain for no gain. Nebraska pushed the ball out of danger, and a 41-yard Scott Livingston punt left Missouri at its own 36. The Tigers again mounted a drive, this time reaching the Nebraska 1-yard line, first-and-goal. Adler fumbled the snap, however, and defensive tackle Mike Keeler recovered at the 3. “Definitely that fumble and our turning around and going the length of the field was the turning point,” said Osborne. The “Scoring Explosion” offense took over, driving 97 yards on 17 plays, the last a 4-yard Gill-to-Fryar touchdown pass with 12:50 remaining in the fourth quarter. Livingston’s extra-point kick made the score 27-13. Missouri managed only three plays, one a 6-yard sack of Adler by middle guard Ken Graeber, before punting. A 13-yard return by Jeff Smith gave the Huskers the ball at the Missouri 44-yard line and 10 plays later, the score was 34-13. Rozier ran the final 9 yards for the touchdown. Rozier finished with 159 rushing yards and the two touchdowns, on 24 carries, his sixth consecutive game with more than 100 yards rushing. He had carried 16 times for 71 yards against Penn State in the opening Kickoff Classic. He scored at least two touchdowns in five-of-seven games. Linebackers Mike Knox and Mark Daum led the Blackshirts, with 17 and 15 tackles respectively. Missouri managed 394 yards of offense, but two interceptions and the lost fumble were critical. In contrast, Gill wasn’t intercepted and the Huskers didn’t lose any of their three fumbles. His words would characterize the next four games, beginning with Colorado. The “Scoring Explosion” offense would be on full display.